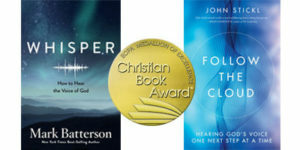 WHISPER by Mark Batterson won the Christian Living Award. FOLLOW THE CLOUD by John Stickl won in the New Author category. Congratulations to our authors, their publishing teams, and everyone at Multnomah and CPG. View the complete list of the 2018 Christian Book Award winners here. The Christian Book Award program has recognized the highest quality in Christian books since 1978. Based on excellence in content, literary quality, design, and impact, the Christian Book Award program is the oldest and among the most prestigious awards in the religious publishing industry. The Evangelical Christian Publishers Association, formed in 1974, is an international non-profit trade organization comprised of member companies that are involved in the publishing and distribution of Christian content worldwide.